The Abuja division of the Federal High Court has fixed May 13 to deliver its ruling on a suit seeking to compel the Economic and Financial Crimes Commission (EFCC), to investigate an allegation that the National Chairman of the All Progressives Congress (APC), Adams Oshiomhole, diverted public funds for his personal use. Justice Anwuli Chikere fixed the date after the adoption of briefs of arguments filed by parties to the suit. ‎She is expected to determine whether or not the EFCC was not statutorily mandated to investigate different petitions that contained allegations of financial recklessness against the APC Chairman. The suit marked FHC/ABJ/CS/628/2018, was filed before the court by an Edo State-based cleric and activist, Bishop Osadolor Ochei. 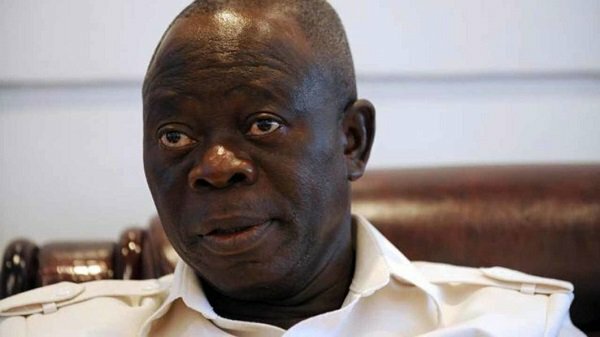 The cleric had in his suit alleged that Oshiomhole had while in office as the governor of Edo State, siphoned funds from the state’s treasury. He specifically alleged that Oshiomhole who was sued as the 2nd Respondent, while in office as governor, acquired properties in United States of America, South Africa and Dubai worth billions of U.S. dollars and far in excess of his legitimate income. He told the court through his counsel, Mrs. Uju Chukwura, that Oshiomhole built a sprawling mansion worth more than N10billion in his home town known as Iyamho, while he was in office as governor. According to him, “the said building was constructed by Verissimo, a South African architectural outfit. The said house of the 2nd Respondent has swimming pools, water fountains, multiple theatres for cinema and live performances, huge event halls, bridges, man-made lake, lodges of different sizes amongst others. The applicant told the court that he had on November 4, 2016, sent a petition to the EFCC, detailing some corrupt practices he said the ex-governor was involved in. He maintained that EFCC’s refusal to act on petitions containing “weighty allegations” against Oshiomhole, ran contrary to Section 15(5) of the 1999 Constitution (as amended) which enjoined the state to abolish corrupt practices. Meanwhile, both the EFCC which was sued as the 1st respondent and Oshiomhole, on Wednesday, challenged the jurisdiction of the court to entertain the suit. In a preliminary objection EFCC through its lawyer, Mrs. Best Ojukwu, further queried the locus-standi of the applicant to file the action. The agency maintained that it has the discretion to decide how to use its available manpower to carry out investigations into petitions that are submitted to it. Though EFCC admitted that it was in receipt of petitions accusing Oshiomhole of complicity in acts of corruption, it, however, told the court that it was not under any obligation to report or give an account of its investigations to any individual or under a timeline within which to carry out its functions. Consequently, EFCC urged the high court to dismiss the suit and decline request for an order of mandamus to compel it to initiate criminal proceedings against Oshiomhole. “That investigation of cases is a holistic process which entails time, resources, inter-agency cooperation, interview of different persons and gathering of evidence over a long period of time depending on the nature of the case and other variables,” it told the court. Besides, the commission, in an 11-paragraphed affidavit that was deposed to by one of its staff, Mr. Yusuf Musa, told the court that it conducts its investigations “professionally and discreetly” before the arrest and prosecution of indicted persons. “That 1st respondent is a statutory body charged principally with the responsibility of investigation and prosecution of economic and financial crimes. That the 1st respondent since its establishment in 2003 till date receives numerous petitions daily in its 11 offices in various parts of the country against different persons both from within and outside Nigeria. “That 1st respondent in carrying out its statutory functions of investigation and prosecution of economic and financial crimes attends to all complaint discreetly and dispassionately without political, ethnic, religious and other extraneous considerations. That the 1st respondent has discretion on how to use its available manpower to carry out investigations into petitions submitted to it.